Looking for a job in Levy County Florida? The following guide provides a listing of Levy County top employers to include local government employment portals, healthcare job links, and a variety of schools that provide great teaching and support staff careers. Great resource! 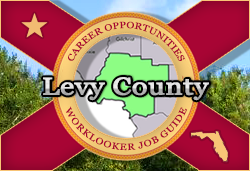 Levy County posts job openings when vacancies exist. During this review there were open positions available such as Lead Driver, Tourist Development Director, Driver I, Support Responder, Single-Certified Paramedic, Combat Firefighter, Dual Certified Firefighter Paramedic, and Combat Firefighter II. Check for current listings. The City of Cedar Key was accepting applications for a Building Code Administrator/ Building Inspector and Marina Attendant. Check for updates. You will have to navigate to Williston's employment link (under "Services") to find listings and employment applications. Visit Worklooker job guides to find top employers and employment opportunity listings in Alachua County, Citrus County, and Marion County. Here you may find open positions such as Clinical Office Assistant, Certified Nursing Assistant CNA, Telemetry CNA, Cath Lab Technician, Director of Laboratory, Quality Director, EMS Emergency Management Coordinator, HR Generalist, Recruiter, Licensed Practical Nurse LPN Medical Surgical, PRN Nursing Jobs, Medical Technologist, Day Shift CNA, PCA Medical Surgical, PCA Telemetry, Phlebotomist, PRN Phlebotomist, Patient Transporter, Physical Therapist PRN, Respiratory Therapist, Registered Nurse RN Full-time, ED Nursing Jobs / Emergency Registered Nurse RN, Registered Nurse ICU, RN Medical Surgical, RN Med surg jobs, OR Registered Nurse, Telemetry RN, RN PACU PRN, Ultrasound Tech and Unit Secretary. Southeastern Integrated Medical (SIMED for short) is a 70+ multi-specialty physician group serving the healthcare needs of patients throughout North Central Florida. SIMED Rehabilitation Medicine had job openings for Licensed Practical Nurse LPN, Clinic Assistant PRN, and Medical Assistant PRN on this review date. Check for updates. Palms Medical Group is a compassionate, patient-focused healthcare provider. During review there were openings for Certified Medical Assistant and Clinical Care Coordinator. The School Board of Levy County has ongoing teaching and support staff jobs available. During this review there were numerous open positions available. Here you may find employment opportunities such as Combination Teacher, Elementary Teaching Job, Exceptional Student Teacher, 5th Grade Teacher, 1st Grade Teacher, 2nd Grade Teacher, School Nurse, 4th Grade Teacher, Language Arts Teacher, Art Teacher, Reading Teacher, Custodial Jobs, Reading Coach, Tutoring Jobs, Speech Language Pathologist, Title I Teacher, Guidance Counselor, AVID Tutor, Substitute Bus Attendant, Substitute Bus Driver, Substitute Custodian, Substitute Food Service Worker, Substitute Teacher, Substitute Teacher Aide, Bus Driver, School Custodian, Custodian, Instructional Aide, Teacher Aide ESE, Carpenter, Maintenance Jobs, Electrician, and Health Assistant. College of Central Florida, Levy Center hires for Administrative, Full-Time Professional and Career, Full-Time Faculty, Adjunct/Part-Time Instructor (Applicant Pool), Part-Time Positions, and Student Employment. Craigslist Gainesville Help Wanted / Clasifieds had open positions such as Housekeeper, Caregiver CNA, Administrative Assistant, Secretary, Pizza Delivery Jobs, Tutor, Delivery Driver, Uber Driver, Event Staff, Shelter Assistant, Truck Driver, CDL Truck Driver, Cashier, Labor needed, Janitorial Jobs, Bike assembly technician, Preschool Teacher, Part Time Teacher, Contractors Needed, Security Officer, Housekeeping Jobs, Software Developer, Dishwasher, Licensed Practical Nurse LPN, Registered Nurse RN, Plumber, Shop Help, Retail Jobs, Store Manager, Food Service Jobs, Kitchen help and Bartender, Painter, Lot Person, Customer Service Representative, VPK Assistant Teacher, and more.